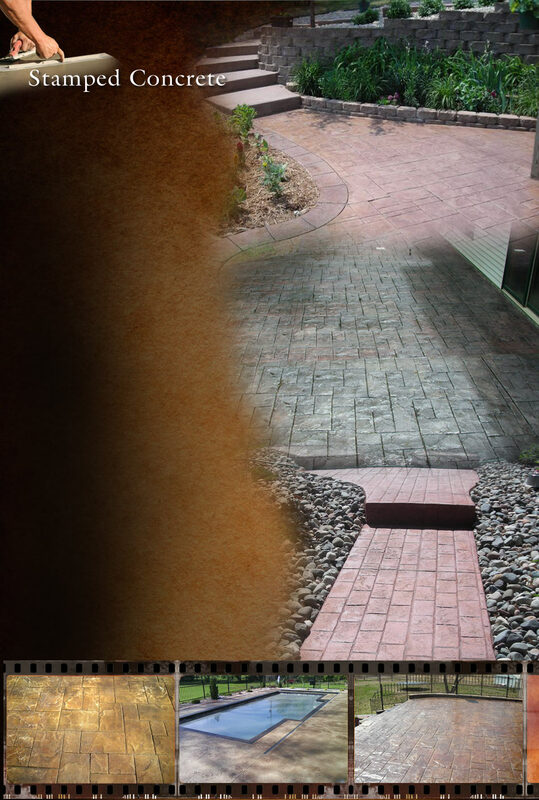 Stamped and stained concrete can be designed to resemble flagstone, pavers, tile, even wood. Due to the wide array of concrete patterns and colors available, and the cost of stamped concrete in relation to other materials, the choice of stamped concrete is becoming more popular. Stamped Concrete is the process of adding texture and color to concrete to make it resemble stone, brick, slate, cobblestone and many other products found in nature including wood, leaves, shells and many more. This limitless array of possibilities combined with great durability and lower cost than other products makes stamped concrete an easy choice for new construction and renovation projects. The installation consists of pressing molds onto the concrete while the concrete is still in its plastic state. Color is achieved by using dry shakes or color hardeners, powder or liquid releases, integral colors or acid stains.